Blue Man Group is an energetic and unique form of entertainment. Their performances are a mixture of light and sound, comedy, and multi-media theatrics. Three bald men (and/or women), using percussion and other instruments, perform a concert with comedy aspects, and often interact with the audience. Blue Man has been popular for years, and Boston is one of only a few cities that has a local permanent venue, the Charles Playhouse in the Theater District. A "Blue Man" is bald and wears shiny (blue) grease paint on their head that doesn’t dry, possesses great musical skills, and has facial and body expressions that convey comedy and many emotions. Blue Men play uniquely designed musical "instruments" at each show, often built out of plastic PVC pipe, and entertain with a combination of a type of pantomime, slapstick comedy, sight gags, and light and sound effects to get the audience laughing. The musical director of Blue Man Group once joked, "We build [create] instruments, and they show up and play them." Their music style is highly energetic, and can be a mixture of rock, techno, and even tribal rhythms. There is a lot of percussion, amplified with state-of-the-art sound systems. Blue Man theatrical concerts use many bright lights, and often musical instruments that flash like billboard marquees. Strobe lights are also used, usually for a few minutes at the end of each show. Blue Men can employ materials such as liquids that become visually beautiful when illuminated, especially when splashed on the top of drums. The audience is cautioned not to wear valuable clothing if seated close to the stage. At times, the nearest seating is called the "poncho area" and the theater may provide ponchos for the audience located there to protect their clothing. The stage company encourages wearing casual attire, and jeans and sneakers are popular. The length of each Blue Man show is about one hour and forty-five minutes. Blue Men are often available in the theater lobby after the shows to greet fans and sign autographs. The stage company asserts that there are even Blue Man groupies, or people that dress in blue costume and attend the shows regularly. 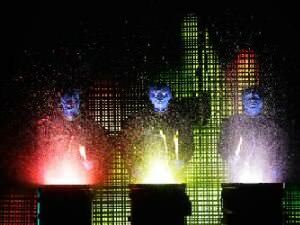 In addition to permanent venues in select cities like Boston, Blue Man Group also tours. They perform unique concerts that may also include guest artists. A unique cover of the Donna Summer song I Feel Love has been highly praised, and is performed at Orlando and Berlin. One can also buy Blue Man Group CDs and DVDs. Blue Man Group shares its home in Boston with Shear Madness, at the Charles Playhouse in the theater district.